They were testing Him! 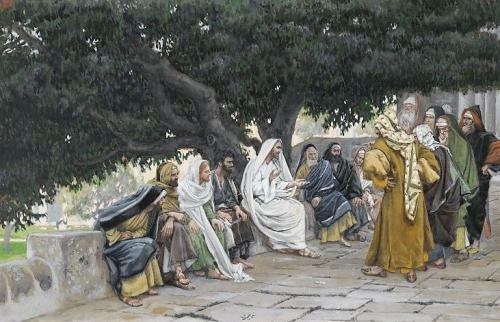 The Pharisees were constantly trying to trap Jesus. Though this is a sad fact, it does teach us a lesson about seeking the truth. One of the most basic goals we must strive for in life is to seek the truth. We must seek to know the truth, and then allow that truth to set us free. On one level, the Pharisees were seeking the truth. They asked Jesus a question about the Law of Moses and His interpretation of that law. Though it is good to ask such a question and to seek an answer from Jesus, there is a subtle distinction that we must make. The distinction has to do with the motive of the asker. In this case, the Pharisees were asking Jesus a question not because they were seeking the truth; rather, they were asking it with the intention of trickery and manipulation. They were looking for anything they could to try to trap Jesus so as to condemn Him. The much better way to ask Jesus a question is to come to Him for two reasons. First, we must come to Him asking questions because we humbly believe that He is the source of all Truth. This takes humility because it requires that we acknowledge that Jesus knows better. He has the answer, a better answer than we have. Secondly, when we ask Jesus a question, we should examine our motivation. Hopefully, our motivation consists in the single fact that we want to know. We have come to believe that He is the source of truth and, therefore, we turn to Him so that we will understand. So, not only do we humbly believe He has the answers, we also sincerely want to know them. This form of an inquisitive and open heart disposes us to receive all that He says to us, as if we were dry land ready to soak up a gentle rain. Reflect, today, upon whether you regularly put all your questions in life before our Lord. If you do, examine your motivation. Strive to have a humble heart that desires to receive the pure truth from the source who is Truth Himself. Lord, I turn to You as the source of all Truth. Teach me Your ways and fill me with Your wisdom. Help me to understand life as You see it and, in that understanding, help me to embrace Your holy will. Jesus, I trust in You.